This chart comes from a recent staff report from the Federal Reserve Bank of New York, which took 51 pages of dense economic jargon and methodological explanations to tell us what many of us commentators already knew. 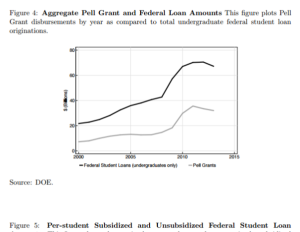 A big reason, if not the main reason, for the rapid rise in college tuitions over the past few decades has been the steady increase of Federal financial aid in the form of grants and loans. After all, we cannot attribute the cost increases, which would naturally go down in the face of lower demand, to rising wages or increased savings rates among Americans. In researching items related to achieving an affordable education one runs across tons of numbers and charts related to the experience. The statistics associated with tuition rises, early dropout rates, graduate debt loads, and unemployment raise awareness that we have a problem. But the tragedy of it all really hits home when we encounter the people behind the numbers. While we can get a general sense of the financial struggles faced by students as a group through raw information, behind every number there’s a face. 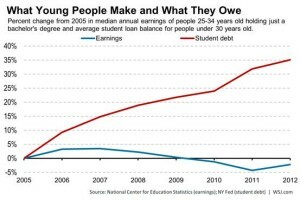 The college unaffordability epidemic has names. Their stories break my heart. Congratulations, high school graduates. You have now exhibited some level of state-mandated proficiency in the core subjects. We exposed you to electives in business, agriculture, theater, psych, theology, sociology and economics. You may have even made some fond memories and lifelong friendships while you were at it. Celebrate this event, smug in your understanding that we will never again expect you to formulate another trigonometric equation, ask you to tell us the capital of Bolivia*, or present a book report complete with dioramas.